EURUSD has been flirting with this major support level, price has been holding above it for the last few weeks now. We’re starting to see the bulls defend this level aggressively, and the price action communicates we may be starting to see the footprint of bullish dominance here. Last session a bullish outside day printed as a result of a strong day yesterday. 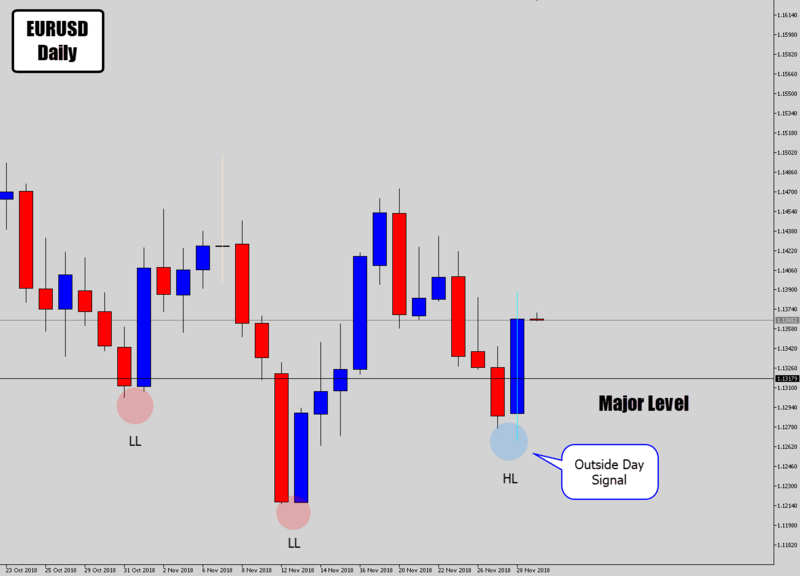 The bullish outside candle is a candlestick buy pattern, and when combined with this major level, holds a lot of value. Another chart pattern is emerging – the inverted head and shoulders. This is a typically found at the bottom of bearish markets around major turning points, and it is a longer term buy signal. Consolidating the two analysis, if the bullish price action signal does follow through, and price does push up – it could develop into a much broader move, giving opportunity to a possible long term trade. So where we can do buy point sir?